Medellin’s newest Cable Propelled Transit (CPT) system, Metrocable Line H, officially started commercial operations on December 17. This 3 station urban gondola line has a length of 1,402 metres, 42 cabins, and a capacity of 1,800 pphpd. Line H. Image from Metro de Medellin. The cable car functions as a feeder line to the new Ayacucho Tram (2016) by extending the reach of rapid transit into the districts of La Sierra, Villa Turbay, and San Antonio de las Torres from the Tram’s Oriente terminus station. Travel times from La Sierra to the city center will be cut by ~40% (from 45 minutes currently to 28 minutes). Line H map. The Ayacucho Tram is shown in the colour green. Prior to Line H, Medellin was already considered the trailblazer in the world of CPT as it was home to three successful urban gondolas (Line K – 2004, Line J – 2008 and Line L – 2010). These aerial lifts, combined with its larger city renewal projects, established Medellin as the leader in sustainable urbanism. While operations for Line H has just started, officials are continuing to work hard to improve transportation options in the City. 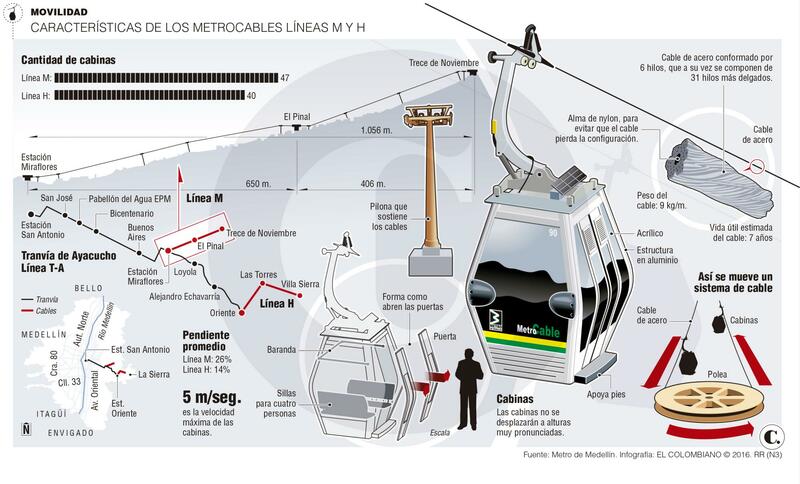 Medellin’s next urban cable car, Line M (1.1km, 3 stations), is scheduled to open in Spring 2017 and will also link to the Ayacucho Tram.